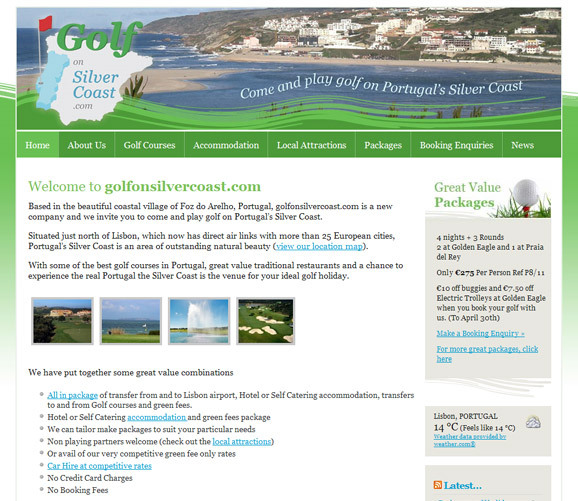 GolfonSilverCoast.com offers golfing holidays on Portugal’s scenic Silver Coast. They have a selection of golf packages which include accommodation in the local towns and rounds of golf in some of the most beautiful and challenging courses. And if you’re looking for something in particular, get in touch using the Booking Enquiries form and Mike will tailor packages to suit your dates and requirements. For the non-golfers among you, don’t get left behind – castles, shopping, beaches, wineries, local cusine.. check out the local attractions. Being an online company it was very important to get the website right so Cookie Web designed a banner featuring the beautiful scenic coastline of Portugal. We went for a nice rich green which gives the site a fresh and friendly look and feel, which mirrors the company’s friendly and personable ethos. Both Cookie Web and GolfonSilverCoast.com are delighted with the results and the site has been getting great reviews from all visitors.